Today I ran the Bioanalyzer on the samples Sam isolated RNA from months ago using RNAzol RT as well as some of the RNA isolated from samples that I have done. The results were not good – no dye showed up, so maybe I did it wrong. TBD. Also, Sam used a kit to clean up the RNA that I have isolated and then ran Qubit and Nanodrop1000, as well as used RNeasy Plus Mini Kit to isolate RNA from untouched hemolymph samples. Low concentrations of RNA, but at least there is RNA. The results from the RNeasy Plus Mini Kit isolations are clean and the RNA on Qubit and Nanodrop1000 are good. Use 2100 Expert software on the desktop. A couple of things: No marker is showing up in any of the wells. Expect a tall, narrow, defined peak at ~20 - 23 seconds. These have not been DNased, so it may not be surprising that these look crazy? Sam notes that the important thing is that this procedure produced clean RNA, which renders the Qubit results believable. He thinks the RNAzol RT isolations I did had too much contamination carried over causing incorrect Qubit measurements. Regardless, we’ll try using TriReagent out as soon as some arrives and ponder the idea of getting some kind of isolation kit (Sam’s suggestion). Plan my attack for bringing samples back to USA: Mail or checked luggage? Today Steven, Sam, and I met to talk about the issue with poor results on the QUbit and Nanodrop1000 on the pooled hemolymph samples I prepared. Short-term plan is to try out the RNA protocol, but multiply all reagents times 6 (so, use 6ml of RNAzol, etc.) to see if that ratio would help; run the Bioanalyzer on the samples that Sam processed as well as some random samples that I isolated. Today, I did the 6x RNA protocol on 4 of the extra samples from day 26 (samples from day 26 were taken in triplicate). It was a bit challenging today because in order to support those larger volumes of reagents, I had to use 13ml round-bottomed tubes. It was difficult to see any pellets or genetic material, but I did my best. I oriented the tubes in the same way every time I put them in the centrifuge and I marked the orienation on the tubes so that I knew where the genetic material should be if it was going well. Per Sam’s suggestion, I resuspended the samples in 25ul of 01% DEPC-treated H20, instead of the typical 50ul. I also pipetted to mix/dissolve. I ran the Qubit, and they were ALL “out of range/too low”. I did not run the Nanodrop, because I can’t remember how to use it. I will do it first thing tomorrow when Sam is in. Last week, I tackled reviwer comments and used mixed effect models for my analyses. I was right to be concerned about using a glmer with tank as a random effect without any way to assign tanks to some tissues. I reverted back to my binomial GLM. Although I obtained a p-value for my lmer analysis, I wasn’t sure if I was going about it correctly. After some Googling, I found a tutorial from Bodo Winter at UC Merced for linear mixed effect models! It has very clear instructions for constructing mixed effects models with lme4 and for using likelihood ratio tests for p-values. In this R script, I modified my code to use likelihood ratio tests instead of an ANOVA workaround. To do this, I needed to build a null model without the fixed effect of interest (either Parental.Treatment or Female.Treatment), and a full model with the effect of interest. 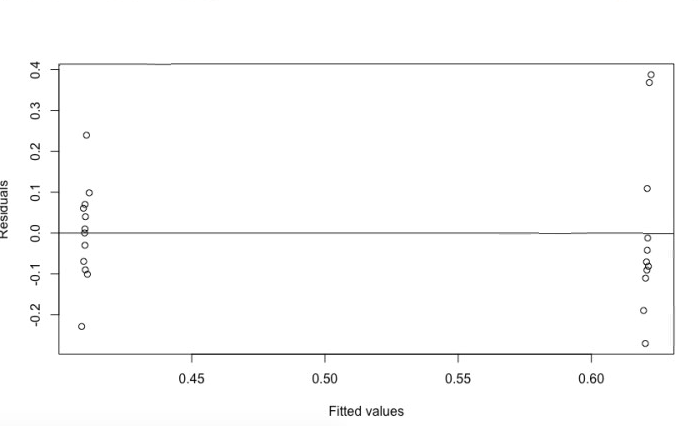 I then used an ANOVA to compare both models and get a p-value. A significant p-value means that the effect is part of the most parsimonious model. When I examined all treatments, I found that parental treatment affected D-hinge counts (Chi-squared = 9.1878, df = 3, p = 0.0269). D-hinge counts were -0.15795 ± 0.10468 lower for low pH female-ambient male and -0.15795 ± 0.10509 lower for low pH female-low pH male. While I have a significant p-value for this model, there is still evidence of a maternal effect. I investigated this further with my second lme using Female.Treatment instead of Parental.Treatment. Female treatment affected D-hinge counts (Chi-squared = 8.1781, df = 1, p = 0.00424). D-hinge counts were -0.21090 ± 0.07033 lower for families with low pH females. To check residual normality, I used qqnorm and qqline. Visual inspection did not reveal any obvious violations of the normality assumption, since the data fell on a straight line. I plotted residuals vs. fitted values to check for linearity and homoskedasticity. There was no heteroskedasticity in my residual plots, but I did see striped patterns. Figure 1. Residual plot for Female.Treatment model. I’m not sure what this means, and neither Google nor my QSCI 483 notes were of any help. This guide suggests that such a pattern in my residual plot is acceptable, but this Bodo Winter tutorial does not. I might bring it up at lab meeting or ask Tim or Julian for some help. My gut feeling is that there’s some caveat to residual analysis with mixed effects models that I’m missing. When I arrived today, there was a “fatal error” in Walnut for February RAW files number 7 and 8. So I tried it again, but it still didn’t work. So then I went back to owl and re-downloaded the two RAW files. I then converted them to .mzML using MSConvert. Then I added them to Walnut, and it worked! Then I hit “Save BLIB”. Then, I went through the DIA protocol, but I made a few changes per Emma’s suggestions. So, with all this changes, the peaks still looked awful. I didn’t calculate an error rate because it felt like a waste of time. Instead I just looked at about 15 or 20 random peptides and noted that not one of them looked good. There was tons of noise and no clear peaks. I don’t know what to do, so I emailed Emma and sent her a .zip of my Skyline document. I JUST sent it a little bit ago (around 4pm), and I know she’s leaving for a bit, so she may not see it for a while, unfortunately. I know Nick from Skyline suggested I use the Advanced Peak Picking option, but the protocol doesn’t have super clear instructions for how to do this for DIA Analysis. Emma told me that the pipeline for this isn’t super concrete yet, so that may be why I’m not sure how to do it. Today I started using Walnut (upgraded PECAN) to create a new BLIB file for the 2015 Oysterseed project. Hopefully this will improve the error rates in Skyline. Also, I called Pam to work on the NPRB progress report. Additionally, I detail Sam’s updates on the status of the Crab pool samples from his notebook post. The RNA needs some cleaning so he suggests trying RNeasy Cleanup Kit. I will wait until he returns Monday and speak in person with him and Steven to figure out what to do next. Walnut is an upgraded PECAN and is used to create the BLIB file which I will use in my DIA analysis of the 2015 Oysterseed RAW files in Skyline. I converted the RAW files to mzML using MSConvert. Then, I uploaded those files to Walnut. Will take a long time so I’ll leave them alone and come back to them tomorrow morning. I called Pam this morning to go over the progress report which is due by July 31st (Tuesday). Unfortunately we’ll have to change/add some things to it regarding the issue with the current pools as detailed in my previous notebook post: Crab Pools and Skyline Update. My post is from right before I left for a little vacation to visit family. So, Sam tried to take a closer look at what is going on. Essentially he used the RNeasy Plus Mini Kit (Qiagen) on the three pools. Then he ran Qubit and Nanodrop1000 with the three pools. The results were similar to what he and I found the day before in that they were not good. The Nanodrop did not detect RNA in the pools. The Qubit didn’t detect RNA in Pool 1, and had very low numbers (~84ng of RNA in each pool) for pools 2 and the MasterPool. Our target for sequencing is to have 1000ng of RNA in each pool, which total volumes of 50 ul. We are not there. So, Sam is thinking of potentially having us try using RNeasy cleanup kit on some “test” samples to see if we can get better Qubit readings.